In the last update, we solved a lot of issues and introduced some nifty new features. We migrated all the code to the new Visuals API 1.3. 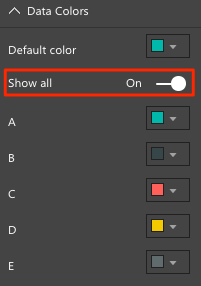 The visual is more stable and the future Power BI updates should not break the visual anymore. Thanks to everyone who reported them. 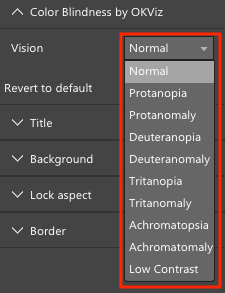 We implemented the Color Blindness by OKViz library. Now you can figure out how people affected by color vision diseases will see the colors of your visual. Read more about it at http://okviz.com/blog/color-blindness. We added the option to change the main color of each bullet based on the bound category. We removed the option to have multiple axis when multiple measures were bound: it was confusing for some users and it introduced some unexpected behaviors. If you need multiple axis, use multiple Bullet Charts. 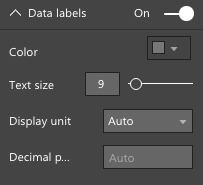 We removed the unit label, both to adhere to the built-in visuals design, and because it is unnecessary when the x-axis is visible. We added the option to sort multiple Bullet Charts by one of the bound measures. We added the option to show Data Labels, as the standard Bar Chart does. 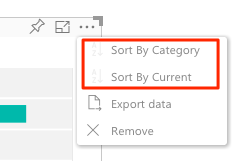 We added the support for drill-down over the Category field. We changed how Targets work. In the previous version, you had to define up to two targets within separated fields, whereas now you have a single field accepting multiple measures. Moreover, now you can set different markers and colors for each target. 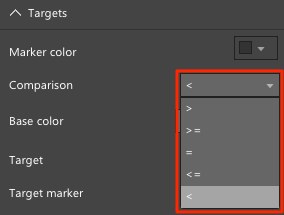 Any color set here is the color that will be assigned to the bullet if the main measure will match the comparison with the target. 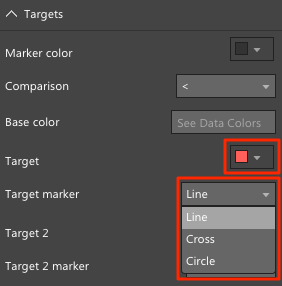 Setup it correctly by choosing the Comparison operator, then the color and the marker appearance from the Targets panel. 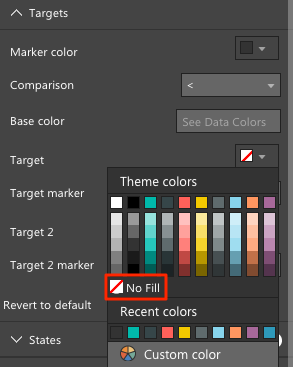 Note that you can choose to not change the bar color, by selecting the No fill value. We changed how States work. Like for the Targets, now you have just one field that accepts multiple measures. 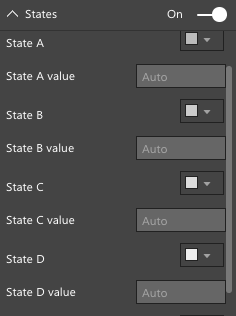 Besides bound measures, you can define up to five manual states in the property panel. Each state value can be defined as an absolute value or as a percentage, by changing the Value type option. Unfortunately, because of some of these changes, the previous version of Bullet Chart (v2.0.7) will not be automatically updated inside your reports. To benefit of all the new features presented here, you have to manually update each report where the component is used. It is a recommend action, also because the previous versions contain deprecated code and we assume that they will stop working very soon. Please, note that the current API lacks the Legend interface, so our component doesn’t include this feature anymore. But don’t worry, it is in our roadmap and we will implement such a feature as soon as this API will be released by Microsoft. Bullet Chart by OKViz is FREE for all, you just have download it from http://okviz.com/bullet-chart. If you have any feedback, leave a track in the comments below. 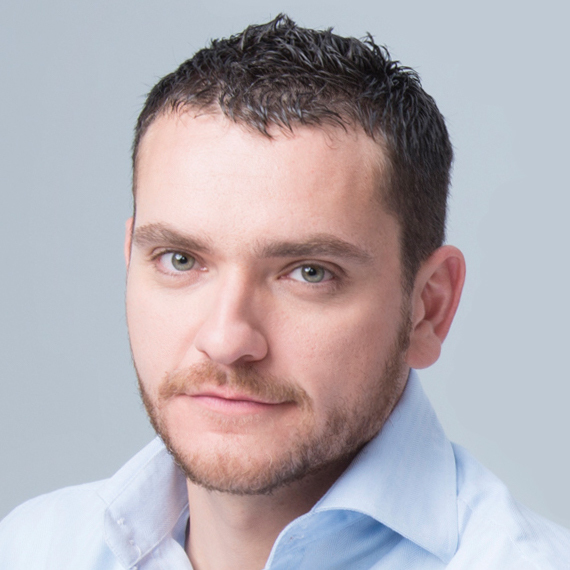 Daniele is a Creative Designer and Senior Web Developer. Throughout his career, Daniele designed over 75 websites, including the current okviz.com.